I’ve decided to start reviewing some classic CRPG’s I’ve played here on the blog recently. Why? Well, there are things I’ve always wanted to say about some games, and it also gives some insight into where I’m going with my own CRPG design. Our first game, Ultima II: Revenge of the Enchantress! It’s fairly clear that the writer was going off of press materials for a lot of their claims. The text makes the game sound enormous and varied and full of places to go and things to buy and people to talk to. Plus their screenshot is perfect; it manages to capture one of the few towns in the game that doesn’t have a silly weird name. I actually didn’t have a chance to play the game until years later, in 7th grade. My math teacher, who was also the head of the lab, had a copy of the game and let me play it. Words can’t describe how thrilled and excited I was! Then I started the game and realized I had no clue how to actually move around. After watching my character get pounded on while frantically pushing every button on the keyboard, I finally found the “/” key let you go down… only to get trapped and killed. I never thought to try the “Return” button for up, who makes “Return” do anything? My teacher, with surprising honesty, told me I hadn’t missed a lot. He said that after awhile you were so powerful that you could kill everything in one blow, and the end game consisted of hitting the sorceress in one chamber and moving to another chamber she teleports to, over and over again. So at least he had finished the game, or at least read the solution somewhere. He then told me something flat out bizarre; that the first town in the game had some festival going on and he couldn’t get anyone to help him, so he stowed away on a ship, after stealing a blue tassel. Ummm yeah… that doesn’t happen in the game. This is a case, I think, of a player injecting their own ideas of story in the absence of one. I didn’t actually play the game in full until years later, when I purchased a PC and the Ultima I-VI compilation CD. I had to download the patches to make it work in modern DOS properly, and I had to live with the awful 4-color EGA graphics, but I was finally able to play it. 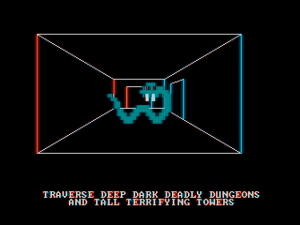 I also played it in a Commodore 64 emulator; the version there is surprising in how they took advantage of the better color palette to make a prettier version. If I was to sum up the game in a few words, it would be: unfinished, juvenile, simple, unrecognized potential. 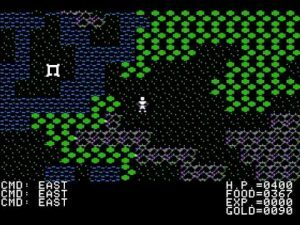 Ultima II was Richard Garriott’s first effort in programming in 6502 assembly. He spent two years on the game while going to college, which he dropped out of afterwards. Which honestly, if you’re making the kind of money he was, why would you need a degree? But I heard that when Origin later bought the source code back from Sierra for re-release, he was very reluctant for his team to see his old work, because he knew how terrible it was. My theory is that he spent a lot of time just figuring out how to program in assembly and get basic game play up and running. Once that was all done he had run out of time to give it much content. Two years in development in an era where most games were programmed in 1-3 months meant that he had a lot of pressure to finish from Sierra. Most of the game logic is very simple, like a BASIC program converted to assembly language. Items in the game are a simple list structure with quantity values, NPC’s just spout the same dialogue unless they’re a special one (drawn from a table), and the “three disks of content” are just extra maps that aren’t necessary to finish the game. The last point makes sense; it was the only way to add content to the game easily. Actual game play, once you know the controls, isn’t too bad. The game is very crisp and responsive. Combat, while simple, is quick and easy. Initially you spend a lot of time stealing food and just waiting for a frigate to come along. Once you have one of those and the ship’s cannons, you’ll level up fast. The whole “time gate mystery” the manual espouses turns out to be pretty simple; the gates do open and close at intervals but their target locations are fixed, so it’s not difficult to figure out. On the downside, you spend 90% of your time grinding for gold to buy hit points and ability score increases. A hex editor would let you skip all of this in seconds. The game is also very, well, how to say this… stupid. There are tons of in-jokes and pop culture references that could only come from the slightly inebriated mind of a teenage developer. (Which, by an amazing coincidence, they did!) Most of the references now would make no sense at all to a modern audience, such as a (misspelled) magic phrase from the movie “Excalibur”. Also, the game is set on Earth, but you can play Tolkien-style races like elves and dwarves? Not that race has any impact in the game on anything other than starting ability scores… My theory is that Garriott, in order to complete the game on time, ported his character system from Ultima I over into assembly as completely as he could. So why wasn’t the game reviled for all of this back when it was released? Well, the fact is, for 1982, the game is REALLY impressive. At that time, more than half of your commercial games were written in BASIC and didn’t look anything like this. The big cloth map and gorgeous box artwork can’t be ignored either; this was a game that looked quality. The fact it retailed for $60 (which adjusting for inflation would be well over $100 today) and it sold over 100,000 units meant it was a very profitable game too. Is it worth playing? Absolutely. This game is an excellent model of a CRPG engine with potential. Had Richard Garriott had more time or more immediate expertise with assembly language and platform building, or even a team of developers aiding him, the game would would have been far better. You just have to look at the following Ultima titles to see that he was able to refine and improve his CRPG designs. 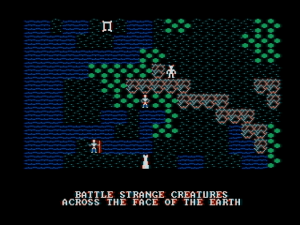 Ultima II is an excellent lesson for a CRPG design enthusiast to study. For example, I’ve looked at the executable in a hex editor and found that all of the in-game text is hard-coded. From a platform standpoint, that’s very limiting. 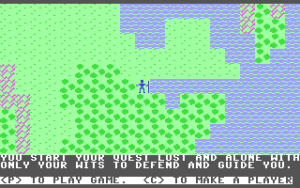 Ultima IV and onward stored NPC text in data files, which was much more flexible. Because Ultima II loads its maps from disk, it makes sense that most of the customization of places (like the names of stores) occurs on the maps themselves using the large letter blocks; this is the one area you could be creative in cheaply with the engine design. 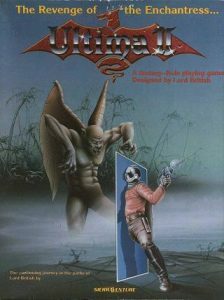 So where can you obtain Ultima II, besides eBay? It’s available as part of a bundle on Good Old games (gog.com) for only $6. GOG does a great job setting the games up to run correctly, using DOSBox as an emulator. You may still need to download some patches if you want better graphics. Please note that the original DOS version also has a flaw in which the galaxy maps didn’t map over correctly. I don’t think GOG has corrected this. 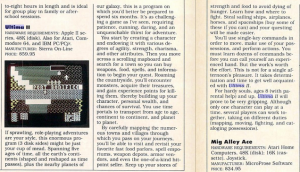 The CRPG Addict reviewed Ultima II early in his blog history. His initial review was harsh and critical but he later admitted in comments he was being overly judgmental of the game, probably because he was comparing it too much to Ultima III and later. RPG Classics has had a shrine to Ultima II set up for several years now. You can find complete information on the game’s content as well as maps for every planet, town, and dungeon. This entry was posted in CRPG, Design, Gaming, Review, Screenshots. Bookmark the permalink.